Summer is prime time for auctions. 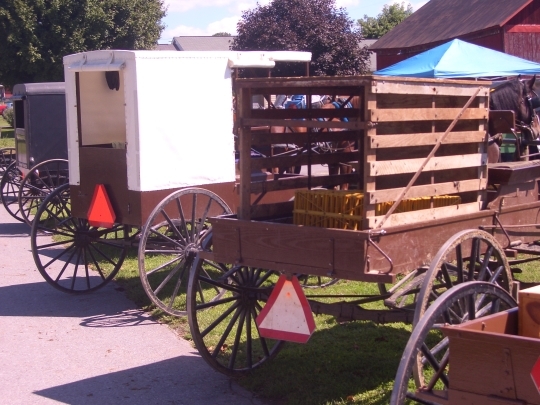 The town of Belleville smack dab in the middle of Big Valley in Mifflin County, PA is home to a long-running auction and flea market, which attracts a large contingent of Amish and English alike. 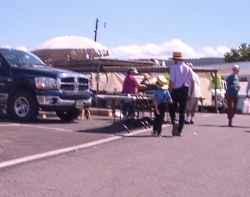 The auction is held each Wednesday year-round. Livestock, farm equipment and many other items go up on the block each week. One comfy ride. And a snack for later. 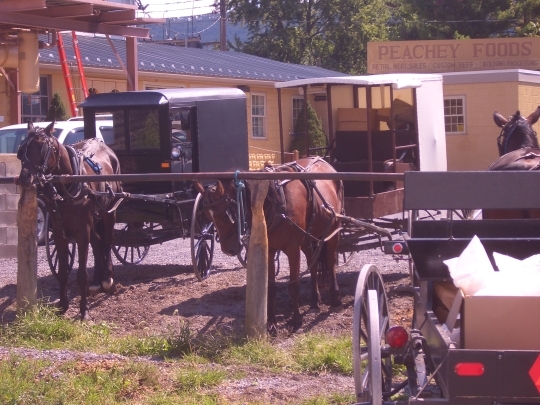 The parking lot is filled with buggies of the three different Amish groups of Big Valley. 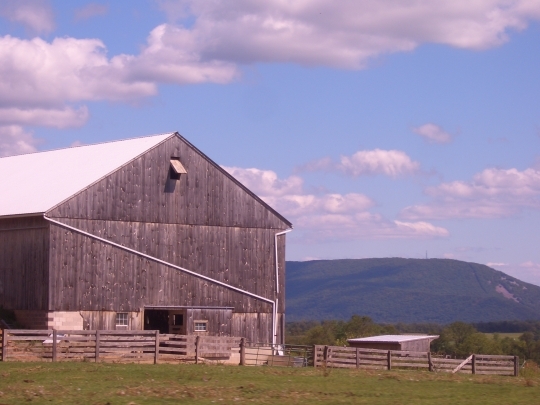 An Amish barn in the Valley. In the picture with the brown wagon with a crate in it, that type of wagon is known in various parts of the country as a spring wagon, platform wagon or mountain wagon. They probably have other names that I am not familiar with, too. I have one that is built nearly identical except that the rear springs on mine are transverse platform style whereas the wagon in the photo has elliptical springs. Mine is a little over 100 years old and was made in Racine, Wisconsin by a company that was called Racine-Satterly or something like that. The wagon with the, ahhh, “custom” seat cover is a spring wagon, too. I’ve never seen wagons built so similar to mine, but there are a couple of them shown in these photos. In fact the hardware on one of them is identical to that on mine. May not mean anything though, because there were literally hundreds, if not thousands of buggy and wagon makers a hundred years ago. I suspect that these are later day copies of wagons that were built by companies that went under generations ago. I loved looking at the pictures, awesome job Erik! OldKat thanks for your added information!! Always enjoy the pictures, Erik! I AM FROM LEWISTOWN AND USED TO GO TO THE AUCTION EVERY WEEK AND I MISS IT SO VERY MUCH. WOULD GET THERE AROUND DAY LIGHT. IF NOT YOU COULDN’T FIND A PLACE TO PARK. GREW UP ON AMISH FOOR AND I MISS IT SO VERY MUCH. Is there anywhere that lists all regularly occuring Amish auctions by sorted by date and place? Nationwide guide to Amish auctions? Ed, if you mean nationwide, I haven’t seen anywhere that lists all of them in one place. There are a number of sites that has auctions listed by region or state, for example the PA Mud Sales. If anyone knows of a resource like that I’d be interested in hearing about it too. Ooooo! Pictures! I loved them! Keep ’em comin’! Now, THAT is MY kind of “shopping experience”! It sure beats walking around like a zombie, pushing a cart in a “big box” store! I just hope that those poor sheep were sold quickly, ’cause they caused me to feel claustrophobic seeing them in their crowded pen. …sure wish I could take you up on your offer, Claudia, but it may be a few years before I make it out there! I was thinking the same thing about the sheep. Hope they got to stretch their legs before too late in the day. Where is this flea market/auction? I want to go! I am now in Meadville/Conneaut Lake, PA., and I’m surrounded by Amish, which I love, but where is this flea market? I have to go!!! Shawn, the Belleville auction in Big Valley is actually pretty easy to find. Here’s an address for your GPS. This is to the Dairy Sales facility but it is all one big compound from what I recall. The auction and market are on the right side of Highway 655 (the long main route through the Kishacoquillas Valley) as you are heading northeast. There is a big parking lot out front. Look for lots of yellow, black, and white buggies. Hope that helps! Would somebody please email me with the info: shawnbutchko@yahoo.com. Thanks. I enjoy reading your blog everyday. Anything Amish I enjoy. Tom, try Googling something like wagon plans, buggy plans etc. Also, try Small Farmers Journal online. I never go to that site, because I enjoy reading the hardcopy edition. BTW: This is a magazine that is very popular among the Amish. Another option might be Rural Heritage, again I don’t go to the online site so can’t tell you what is there. 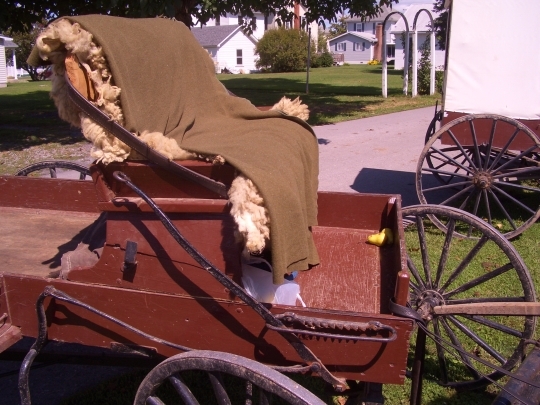 Many of the Amish “buggies” appear to me to actually be a modified spring wagon, which has had the top enclosed. This is really quite different than the historical “doctors” buggy in size, design and construction. One thing that I have seen on quite a few Amish buggies that surprised me was fiberglass wheels. Makes sense though, because they see alot of service. Mary Alice, sheep are very much herd animals. In fact possibly THE most herd oriented domestic animal. While it may look crowded in those holding pens, they were no doubt much more comnfortable than you or I would be under the same circumstances. 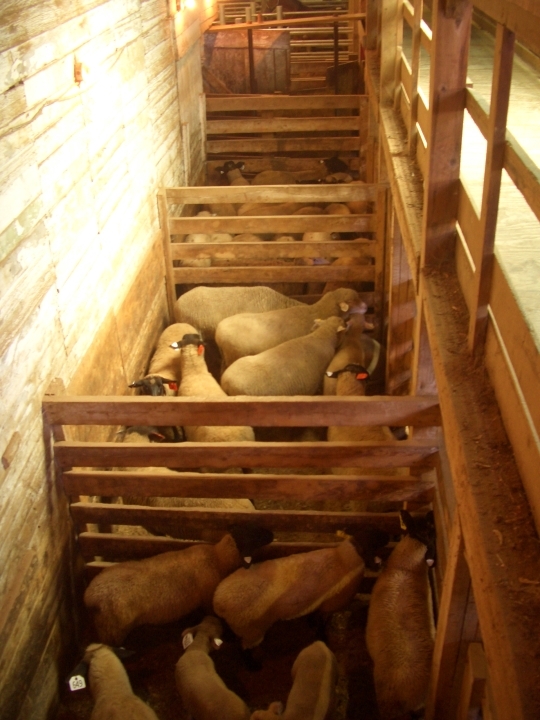 If you put a single sheep in that situation they would be far more stressed than that group was. You wouldn’t hold them for days in a pen that crowded, but their body language tells me that they were pretty comfy; no pushing, not stirring around. Sounds like a fun place to be though. Maybe not so much if you are a sheep! For a good story on Big Valley buggy makers, order a copy of this mahttp://www.commonground-pa.com/Common_Ground_Magazine/CG_Classics.html#84gazine. The Common Ground magazine is a local magazine, been published since 1989. Their website is www.commonground-pa.com The magazine has pictures of the Big Valley Amish in every issue, but the magazine isn’t just about the Amish, it’s about our region around the Juniata River, taking in Mifflin, Juniata and Huntingdon counties. Printed quarterly, it’s a colorful and interesting magazine. Of course I’m a little partial, because I write an antique article for it when able to pull myself away from my bnb duties. But those of you who love to see pictures of the Amish working etc, this magazine will capture your heart! For those of you who have asked where Belleville is, it’s located west of Harrisburg, east of Altoona and just south of State College on route 655, which runs between routes 322 and 22. Also a note on the sheep in the sale barn; all the animals arrive Weds morning and are sold in the afternoon, leaving for their new homes. They aren’t in the pens for very long. The local spca checks to make sure they have water and conditions are keep favorable and legal for the animals. I also enjoyed the Common Ground magazine when you shared it before, really nicely done I thought. Where can people find a copy when they’re in Big Valley? The magazine can be found on the counters at Peights Store, the White Hall Store and also AJ Peachey’s. Can’t think off hand where else in the valley it can be found. Just call the magazine at 717.899.6133 and they’ll be happy to mail you a copy, or tell you other places to find it. You can see and read some samples at their website. I seen on the news last night that a 3 year old Amish girl was killed in Hopkinsville, Kentucky on Friday night. Their buggy was struck by a semi truck. The driver was under the influence, and has been charged. A sad event for sure. I live in Central PA. Every month there is some sort of Amish charity or consignment auction that are very much like County fairs. Every June is the Troutville School auction around the 23rd. It is held at a family farm. There is an auction at another farm in Luthersburg on the 23rd of this month (July) and there will be another near Punxsutawney next month. The first 2 mentioned brings in an auctioneer from Baltic Ohio. His name is Andy Raber. I go to many auctions and he is the best I’ve ever heard. Many of the “English” auctioneers in the area have an Amishman as a helper that does some auctioneering. Sometimes it’s comical because if they bring an item up that they are not familiar with (some electric household item for instance) they have a difficult time saying what it is. One place to check out auctions in general is Auction Zip (http://www.auctionzip.com/). If the auctioneer is Amish and has someone who is English help them they are sometimes listed there. You just enter your zip code and it lists the auctions in the area. Andy Raber has a guy who is either Mennonite or was once Amish that helps him (and visa versa). His name is Vern Yoder. He has a website (http://www.auctionzip.com/OH-Auctioneers/97532.html) and does a lot of produce auctions around the New Wilmington Pa area. He does not list the auctions he helps Andy with. I have a flyer for the sale on the 23rd in Luthersburg if anyone wants it or if it can be posted. On auctionzip.com check out auctions by our Big Valley auctioneer, Aaron Kanagy of K & R Auctioneering. He does a great auction in English and will switch to dutch as necessary. He auctions regularly at the Kish Valley Dairy Sale Barn in Belleville. A different sale barn from the previously big topic of the Belleville Sale Barn. Aaron does estate sales unsite or at the Kish barn; selling anything from estates, household items or livestock. 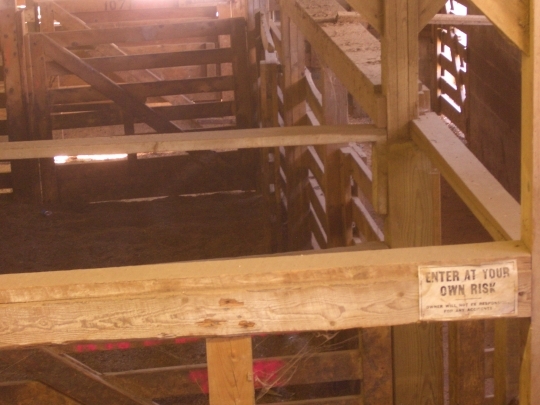 The Kish Sale Barn has an auction once per month, but on the off weeks, Aaron will hold household auctions on the premises. Although I never replied to her postings on her site, I enjoyed her work and thought it powerful and spiritually insightful. I hope she appears on Amish America from time to time if she is fully lead to quit her blog (that sounds more like a Quaker phrase than an Anabaptist one, but oh well) and shares her opinion on life in her chosen religion and one of the groups under it’s umbrella here at Amish America. Thanks for the note Shom, sorry to hear about that. We haven’t always agreed, but I do like hearing from Lucy. I also think it would be great to continue to get her input here. I posted a slide show of our visit to Belleville in June, 2011. I found your site, Eric, through reviewing Suzanne Woods Fisher’s new book. So happy I did! Thanks so much for the article on the Bellville Amish. We have traveled there several times. It is interesting to see the differences in the buggies, and the clothing and some of the baked goods. I must say that in Lancaster County, PA I have seen only 1 buggy with wheel lights. It was interesting and also seemed to be somewhat of a safety feature. Can’t wait for the next articles on the Belleville Auction. Glad you liked it Julie! We do have a new post up today on this community.